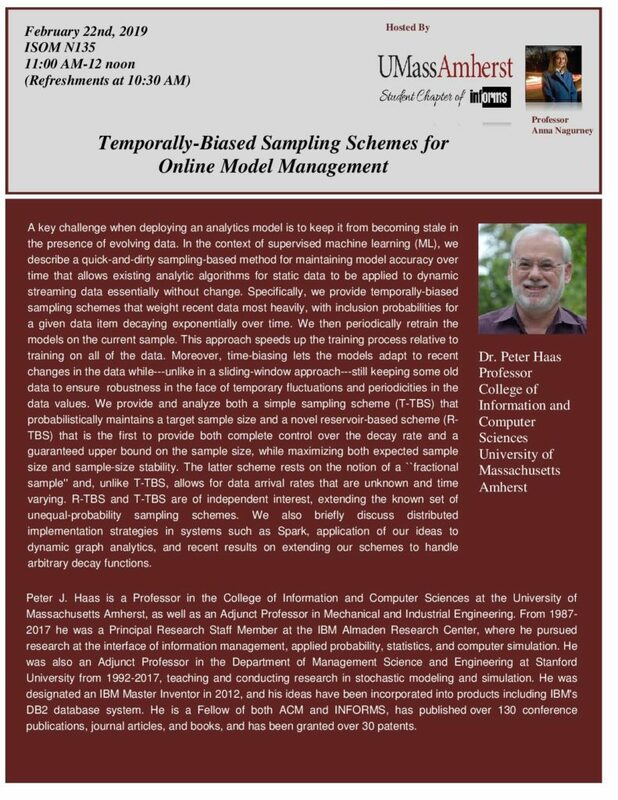 One of the favorite aspects of being the Faculty Advisor to the UMass Amherst INFORMS Student Chapter (and since I have had this role since 2004, I must really enjoy it) is helping the students organize the Speaker Series each semester. There is a lot of planning that goes into this, as well as some serendipity. It is always wonderful to have speakers even reach out to us because they want to speak in our Series. Hosting speakers requires excellent logistics, attention to details, and warm hospitality because one wants to create a pleasant experience for all. This semester has been extra exciting since we are now holding the talks in our new $62million Business Innovation Hub of the Isenberg School, which was opened "for business" in late January 2019. Thus far, this semester, we have had the pleasure of hosting two speakers, Professor Aurora Liu of the Isenberg School, who spoke on February 1, and Professor Peter Haas of the UMass Amherst's College of Information and Computer Sciences, who spoke this past Friday. The posters for their fabulous talks are below. 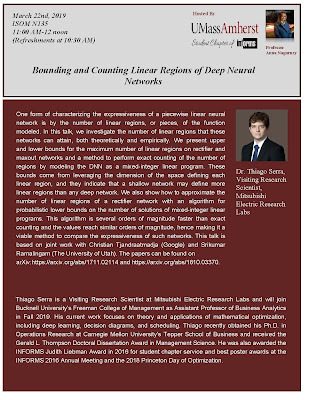 Next month we will be hosting two speakers, which we are also very excited about: Dr. Jurij Paraszczak and Dr. Thiago Serra. The posters announcing their talks are below. Interestingly, all of our speakers this semester have had industrial experience - Dr. Liu was a management consultant focusing on mergers and acquisitions in pharma earlier in her career; Dr. Haas spent over 30 years at IBM and is both an INFORMS Fellow and an ACM Fellow (we believe he is the only individual to have earned this two major accolades). 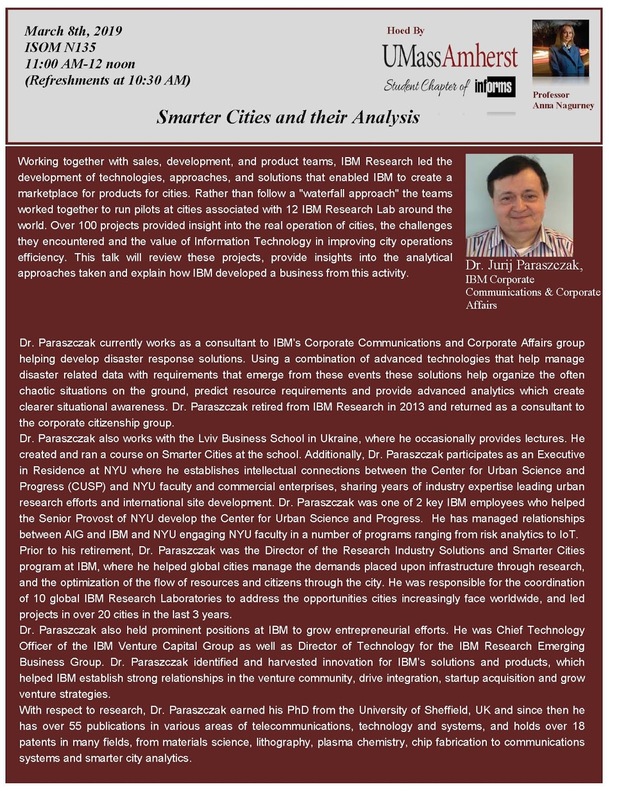 Dr. Jurij Paraszczak, is also a long-time IBMer, and Dr. Thiago Serra is now at the Mitsubishi Electric Research Labs in Cambridge, MA, before he joins the faculty of Bucknell University in the Fall 2019! 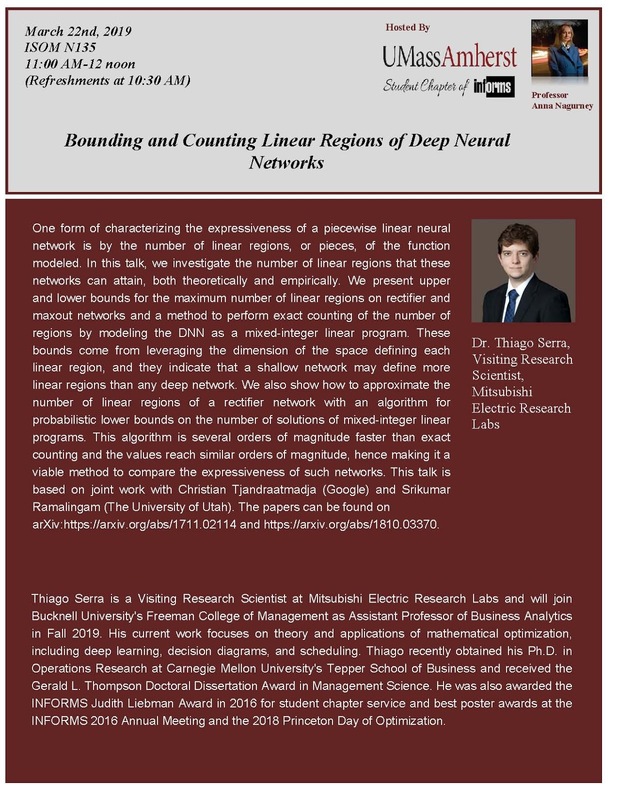 Both speakers, to-date, have emphasized networks and graphs (near and dear to my heart) and the solution of very large-scale problems on Big Data, including dynamic Twitter data. They have attracted audiences from the Isenberg School of Engineering, the UMass Amherst College of Engineering, as well as the College of Computer and Information Sciences. The talks have demonstrated the need for the integration of a variety of methodological tools (helpful, if your team and co-authors have such skill sets) from probability and statistics, to graph analytics, optimization, network analysis and centrality measures, algorithm development, including for machine learning, and even stochastic dynamical systems (loved that part, too)! Many thanks to the Chapter President, Katerina Deliali, for expertly constructing the above posters and introducing the speakers. Also, thanks to our amazing Chapter Webmaster, Haris Sipetas, who so promptly posts writeups and photos after the speakers' visits. Plus, please visit the Chapter's Youtube channel, where interviews with our great speakers are posted - more coming soon! And I can't resist also sharing with you a few photos from our first two talks! Below are photos from Professor Aurora's talk and lunch afterwards. And below are a few photos from Professor Haas's presentation and lunch afterwards. Of course, as is our tradition, we always share desserts! Today is Valentine's Day and I brought muffins from Whole Foods (so they must be healthy) for the students in my Humanitarian Logistics and Healthcare class at the Isenberg School. I thought it a nice way to celebrate the holiday and also to show appreciation to my students for their great questions this past Tuesday on our class field trip to the UMass Amherst Police Department at the corner of East Pleasant Street and Eastman Lane in Amherst. I am a big believer in hosting practitioners in such a class as well as organizing field trips and, since the class meets early, from 8:30-10:00AM, that helps with the logistics of such special experiences. Our host was Lt. Tom O'Donnell, who himself is a UMass Amherst grad in criminal science, and the experience was so educational and fascinating that today I delivered a gift to him, along with a thank you card signed by the students. Thanks for the note, it is very kind of you. Please let the students know they asked some of the best questions I have ever had. I can usually guess the questions that will be asked when giving a tour, and your class asked some of the most in-depth questions that I can remember. The field trip began with a session in a classroom at the police station, which included a lot of Q&A. We got to hear the challenges of policing at UMass Amherst over thirty years and how the challenges have changed over time. It was very impressive to learn about how the police department prepares over months for special scheduled events and also how it anticipates incidents. There are 61 police officers, who are supplemented with cadets that live in the dorms and provide useful input. The UMass Amherst Police Department also is heavily involved in the community and has organized fishing trips, an Amazing Race, and even bike rodeos. It has also hosted middle schoolers for movies. The UMass Amherst police officers all are professionally trained. Because of their expertise they are sometimes even called upon by the neighboring town of Hadley, which has a tiny police force. The humanity of Lt. Tom O'Donnell was so apparent and his concern about students and their welfare. He even noted how students, these days, are under so much pressure to succeed and this can impact their mental health. The Police Station, which is only a few years old, is stunning and another highlight was touring the facility, from the high tech room, where we got to meet and speak with the dispatchers (and marveled at the big screen with the weather, since we were facing a big snowstorm) to even the cells, where there are places for those under protective custody. Everything has been thought through, from the best way to deliver those brought in, to audio and video equipment to record answers of those brought in, to questions that they are asked to ascertain their condition, such as: Who is the President of the US? Even the flusher for each toilet in a cell is located outside the cell. We were asked whether we knew the reason behind this. We saw the blankets, carefully wrapped, and used for those who stay overnight and learned how those brought in are fed before being released or transferred to the Northampton facility. What also amazed me is how spotless everything was - very scrubbed and well-maintained. We learned about "Run, Hide, Fight" in case of certain incidents and that the police department will soon be introducing a six minute video, which I am sure will be a must-see. The impact that Lt. Tom O'Donnell has had and continues to have also reaches outside of our community to, would you believe, Ecuador! In January, at about the same time that I was taking part in and speaking at the fabulous Congreso Futuro in Chile, Lt. O'Donnell, with a coterie of colleagues, was training police in Ecuador. He shared with us some of the policing techniques that they educated the police force there on (and, frankly, I will be checking out episodes of Law and Order to see if the right tactics are being followed), which will be shared with 40,000 police members nationally in Ecuador. After the indoor time, we took a group photo. For those who did not have to rush off to their next class at 10AM on campus, we got to tour the garage, where the police bikes are stored, and the special vehicles in the lot, including a Humvee and the Command Center. We did not get a chance to see the police horses, who are housed elsewhere! And, to top off the fantastic field trip, we even received 5 souvenirs each from Lt. O'Donnell and the UMass Amherst Police Department, including a portable stapler, which will come in good use, and a lovely notebook with colorful stickers, and even tissues, given that this is winter! A huge thank to to Lt. Tom O'Donnell for a wonderful educational experience for my class! We so much appreciate what you and the UMass Amherst Police Department do for our great university and beyond. 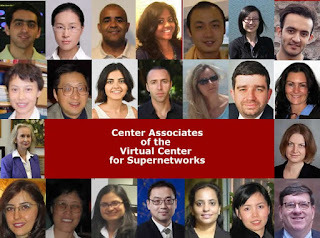 In 2001, the Virtual Center for Supernetworks was established at the Isenberg School of Management at UMass Amherst and I have continued to serve as its Founding Director. 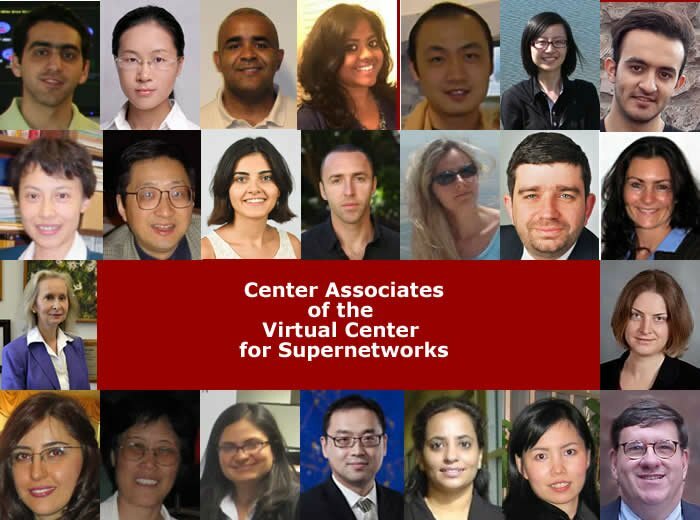 Each year we produce three newsletters to keep our stakeholders and constituents informed of activities at the Center and also the successes of the Supernetwork Center Associates, which include faculty, practitioners, as well as doctoral students. 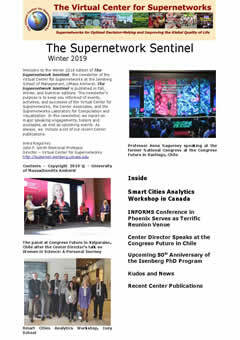 It gives me great pleasure to announce that the Winter 2019 edition of The Supernetwork Sentinel, the newsletter of the Supernetwork Center is now available and online. I am so honored to serve as the Center's Director and continue to marvel as to how much this remarkable team accomplishes through mutual support in all of its endeavors from research to outreach and various other professional activities. All newsletters can be downloaded and viewed from here.